This text describes the layout and main functions of the rear panel of our nEar08 eXperience active monitors. Unbalanced wiring works with either a 2- or 3-conductor TRS connector. A 2-conductor TRS plug (or sometimes also just called TS plug) automatically grounds the minus signal input, whereas a 3-conductor TRS plug wired unbalanced provides the option of leaving the minus open or grounded. We recommend that you ground the unused part. 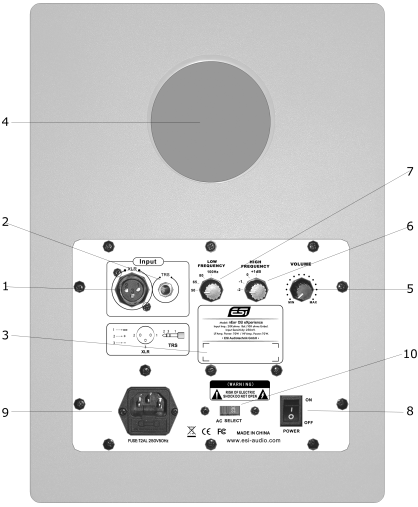 3. serial number - this label contains the product serial number. 4. vent port - nEar08 eXperience is a vented box speaker system with a vent port on the rear panel. Make sure you are not blocking the vent port (i.e. by putting the speaker too close to a wall) or the sound colour will be changed. 5. volume control knob - use the volume control knob to set the proper input level from the sound source. Make sure to setup the left / right speakers accordingly. 6. high frequency level selection - this rotary switch allows you to change the level of the high frequencies in the signal to control room dumping in the range -2 to +1 dB in 1dB steps. Depending to your specific listening environment whether they require such a change, you can adjust it here. The recommended default is the 0dB setting. 7. low frequency boost selection - this rotary switch allows you to change the level of the low frequencies in the signal great for tuning the nEar08 eXperience if you are using a separate subwoofer like the ESI SW10K eXperience. 8. power switch - when you push the power switch, nEar08 eXperience will be turned on, and -surprise- it will be turned off when you push the power switch again. 9. power port with ext. fuse - use this connector to plug in the detachable 3-circuit line cord that connects to the power outlet. The connector also contains the mains fuse for protection. 10. AC selection - you can select either 110V or 230V AC power according to your local requirements. Make sure this is selected properly before you switch on nEar08 eXperience for the first time or your equipment could be damaged.